After introduction of this website, I have been receiving many enquiries and clarifications on different subjects on daily basis. Please accept my apology on my inability to reply individually for all questions. However, I treat each question of you a valuable one. You can certainly expect reply on all of your questions in this website as articles which will be posted time to time. Bill of lading and airway bill are the document issued by the carrier of goods while booking cargo with them by shipper. What is the Airway bill and how does airway bill work? What is the difference between BL and AWB? Airway bill is issued by air carrier of goods on receipt of goods after completion of export customs formalities of the country. Shipper obtains airway bill once after handing over cargo to them. Since the cargo reaches by air and transit time is too less compared to sea shipment, a set of airway bill is sent along with the cargo for immediate reference on transit and for import customs clearance at destination port by importer. Once after completion of customs formalities at load port customs location, cargo transfer manifest (CTM) issued by IATA agent along with airway bill and other required documents for transportation submits to air carriers. Original airway bills are issued in quintuplicate which is meant for carrier, importer, shipper and additional copies. 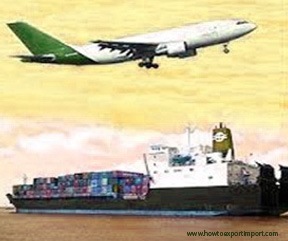 Once after arrival of cargo at destination, the importer or his cargo agent approaches the destination office of air carrier and collect airway bill and other required documents sent by shipper along with cargo for necessary documentation for import customs clearance procedures and other references. Importer may also collect copies of documents by courier or mail from shipper before arrival of goods. The shipper also can arrange to send airway bill and other documents through his bank to meet LC requirements or he desires. The major difference between bill of lading and Airway bill is that, Airway bill is not a document of title. However, airway bill can be prepared in such a way to treat as document of title and negotiable document. How does bill of lading work? What is bill of lading? How bill of lading works?. Bill of lading is a document issued by sea carrier of goods on receipt of cargo to him from the shipper. Bill of lading is issued to shipper after completion of export customs clearance procedures at load port customs location of the country. After completion of export customs formalities, shipper hands over cargo to sea shipping carrier or his agent. As proof of receipt of goods, sea carrier or his agent issues a document which is called bill of lading. Bill of lading is generally issued in triplicate with non negotiable copies. BL also is issued in quintuplicate on special request by shipper. Once after obtaining original bill of lading from the sea carrier, shipper submits bill of lading with other documents with his bank, in turn bank sends to importer through importer’s bank. Importer collects bill of lading and other required documents from his bank and arranges for import customs clearance procedures. The shipper can surrender original bill of lading at load port where BL has been released and arranges to send a OBL release message to the counterpart office of sea carrier and advise them to release cargo without insisting for original bill of lading from consignee. The shipper also can release Seaway bill where in no original bill of lading procedures involved. In short, Airway bill is a document of proof of receipt issued by air carrier of goods to shipper on receipt of goods for on carriage. Where as bill of lading is a document of proof of receipt issued by sea carrier of goods to shipper on receipt of goods for on carriage. Also read 3 Reasons under Importance of bill of lading in international trade Different types of Bill of Lading Is Airway bill a documents of title? Can two shipments under different schemes be under one Airway bill? I hope I could clarify, Airway bill Vs Bill of lading – How does airway bill work and how bill of lading works and how to differentiate airway bill and bill of lading. Please discuss below your thoughts on this subject. Rakesh Jain: On 13 July 2015 I am a online seller. I sell books online and ship mainly to US. My customers are students and most of the packets carry one book only valuing an average of 20 to 30$. The orders are collected by a agent in USA. He passes on the orders to us and we ship directly to buyers. The buyer then makes payment to us in bulk, covering a number of shipments. These shipments are sent through DHL courier. DHL treats Books as documents and takes them in document mode. Our bank is asking for custom documents against the foreign payment received by us. We only have DHL invoices and DHL awb copies as proof. There is no custom document from DHL as the packets are carried under document category. AND we do not claim any export benefits. Please advice how to convince the bank to accept DHL invoices as proof of export. NITIN PATIL: On 06 April 2016 Dear Sir, thanks to create website like this. this articles is very useful to new importer & Exporter. one more doubt i have i.e. is there have "BILL OF LADING' document in EXPORT by AIR CARRIER.